“Unfortunately, yes. I think our plan is to take Lord Hartshorne’s carriage. At least I hope it is, because his is incomparably better than mine ever was.” Rachel smiled at the thought. 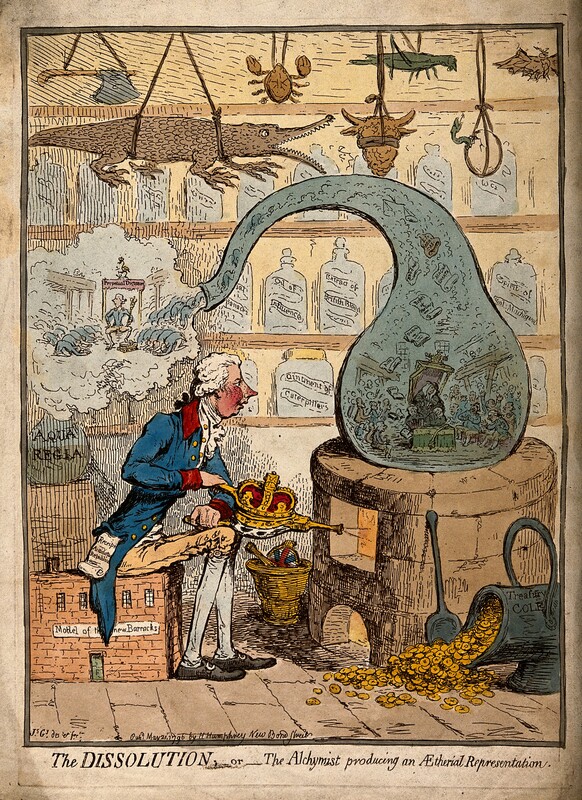 In this Gilray Cartoon, Pitt the younger is distilling Royal favour and gold to further his dreams of power. Aqua Regia – the water of kings – is a mixture of hydrochloric and nitric acids which has the happy property of dissolving gold. I’m not sure what the issue was about the barracks he’s sitting on, but there was certainly some scandal or another. One of the big differences between Alchemy – prescientific chemistry – and chemistry is that scientists keep records that others can use to reproduce their work. Rupert’s missing notebook might be important. Nice snippet–Lady Bedlington seemed pretty upset. Why only three good teacups? Wonder if she will accept her help. Mrs. Hobbes doesn’t seem to care much for the visitors. No she doesn’t. Thank you for reading. Next Next post: Beta Reading?